Your abdominal muscles were stretch and sometimes injured to provide space to your baby. This is the cause of diastasis (a gap in your belly) and often of transverse muscle weakness. Your hormones also play a big part in abdominal and pelvis muscles relaxations to help the birth of your baby. If you gave birth through a C-section, adhesions due to the scare are another cause of lack of control and weakness of the transverse muscle. Consequently, you need to regain good sensations and control of your transverse muscles. They are essential, working as a belt around your abdomen holding your organ and limiting pressure on your pelvis floor when you cough, sneeze, laugh or run. If this pressure is not limited it leads to incontinence and prolapses. 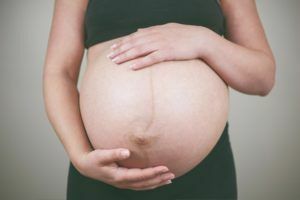 Do not hesitate to have a look to our blog; there are articles wrote by our women’s health (obstetric) physiotherapist on abdominal anatomy and related dysfunction to help you understand these problems. Abdominal rehabilitation can start few days after you gave birth. This rehabilitation is divided on different steps dependant of your post-partum stage. The aim is to gently mobilise your abdominal transverse muscle to regain awareness of your body thanks to a breathing approach. LEARN TO EXHALE AND ENGAGE PELVIS MUSCLE PERFORMING AN EFFORT. Our woman’s health (obstetric) physiotherapist will offer to apply a K-Taping to enhance the speed of closure of the post-natal diastasis . At the same time, the Abdominal Rehabilitation will start using the The ABDO-MG® (Abdominaux Méthode Guillarme) approach: It is a functional rehabilitation method respecting abdominal physiology. It associates control exhalation through a special device with an abdominal stimulation triggered thanks to this exhalation. Integration of control exhalation in the abdominal rehabilitation guarantee a safe approach allowing an early start, even just few days after you gave birth or you had a surgery. Abdo-MG aims at recovering functional abdominal muscles enhancing breathing and integrating good habits in you daily life. When the gap in rectus abdomini (diastasis) is closed, it will be possible to start a specific rehabilitation for your transverse muscle. It is FORBIDDEN, even more after giving birth but also true for any woman, to do hyper pressure abdominal exercises (crunches, sit ups…). Indeed, these types of exercises create a strong push towards the floor. The increase pressure in the abdomen prevents to engage pelvis muscle letting visceral organ to drop (internal link to “mauvais abdo”). Therefore, our women health (obstetric) physiotherapist will teach you a zero pressure gymnastic preventing the push toward the floor to protect your pelvis muscles and avoid incontinence and prolapses.